Wheels are 10" dia. x .125" thick. 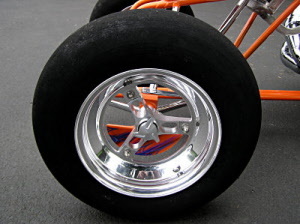 The 5 inch wide wheels have a 2" offset and a 3" backset. The tire valve business has been turned "upside down!" New advanced internal design for tire inflation. 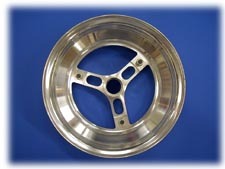 * Made especially for custom and racing wheels. * Smooth appearance - low profile, prevents broken stems. * Makes cleaning and polishing easier. * 2 inflation adapters included. 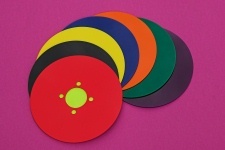 Lightweight non-transparent plastic disk to insure the staging lights don't shine "through" your front wheels! Only one disk is needed to do the job. Mount to either wheel. 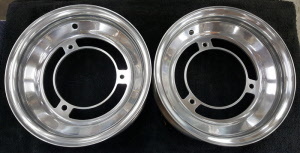 Fits the 4-bolt brake rotor bolt pattern of YFZ450, Banshee, 660 Raptor, 700 Raptor and '86'/87 TRX250R front wheel hubs. 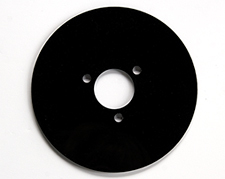 Lightweight black plastic disk to insure the staging lights don't shine "through" your front wheels! Only one disk is needed to do the job. Mount to either wheel. Fits the 3-bolt Honda brake rotor bolt pattern of TRX400EX, TRX450R and '88/'89 TRX250R front wheel hubs. Convert your BANSHEE Front Hubs to fit 5/8" Straight Drag Spindles. This kit consists of: two 42mm O.D. sealed inner bearings, two 35mm O.D. sealed outer bearings, two custom billet aluminum CNC machined spacer bushings and two nylock jam nuts. 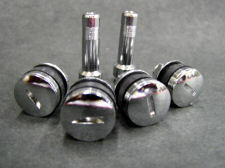 Convert your Yamaha RAPTOR Front Hubs to fit 5/8" Straight Drag Spindles. Convert your YFZ450 Front Hubs to fit 5/8" Straight Drag Spindles. 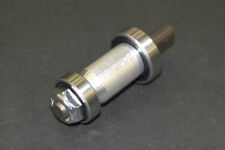 Convert your 1988/1989 HONDA TRX250R Front Hubs to fit 5/8" Straight Drag Spindles. FITS 1988/1989 HONDA HUBS ONLY... WILL NOT WORK WITH 1986/1987 HONDA HUBS. Convert your HONDA TRX400EX Front Hubs to fit 5/8" Straight Drag Spindles.